What the sheep did: Visiting the home of a literary legend. Visiting the home of a literary legend. Where Margaret drew her inspiration for good books like The Diviners and The Stone Angel. "Manawaka" = Neepawa. 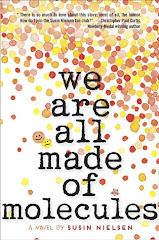 I just finished reading We Are All Made of Molecules by Susin Nielsen. I really identified with the main character Stewart. He reminded me of me at that age, 13, academically brilliant but, let's just say, not really popular with the ladies or well, anyone for that matter really. To make matters worse, he and his dad end up moving in with his dad's girlfriend, who has a fourteen-year-old daughter named Ashley who is definitely a lot more popular than Stewart. Stewart is willing to make the best of it, but Ashley definitely is not. You can kind of see where this is going as they have absolutely nothing in common. Well, I guess there is one thing. As the title says, they, like everyone else, are all made of molecules. That's right... I'm a pool shark... sheep. I think I'd rather be curling.